According to The Hostapedia by Mark Zilis (2009), "Hosta tibae is notable for its branched flower scapes and makes a fairly dense mound of slightly rippled, green foliage...Its scientific name has been altered a few times over the years. It was known as Hosta chibai in gardens for many years, then briefly Hosta tibai. Finally the name became Hosta tibae (Schmid 1991)..."
This medium size (16 inches high by around 37 inches wide) hosta has shiny, green foliage. It bears purple flowers with yellow anthers on branched scapes in September. The species originates in Japan and is similar to Hosta capitata. 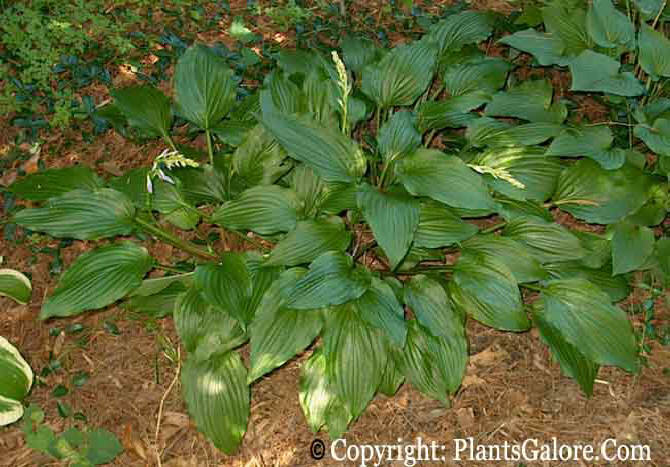 The Hostapedia by Mark Zilis (2009), states "As a garden specimen, Hosta tibae makes a fairly average mound of green foliage. It does have a distinctive feature, however, being the only hosta species with branched scapes." From the Field Guide to Hostas by Mark Zilis (2014), "During a 2012 trip to Japan, I was shown three forms of H. tibae that differed greatly from the version grown in the United States." The New Encyclopedia of Hostas by Diana Grenfell (2009) states: "Valuable for its late flowers...Thin, multi-branched scapes are unusual for Hosta." Note: According to Schmid, H. tsushimensis also has branched flower stalks.